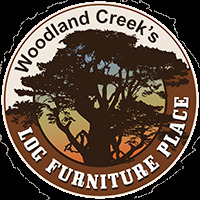 -- Please Select --Counter Height - 24" Bar Height - 30"
The largest manufacturer of handcrafted quality log furnishings in America comes the all new Homestead Collection line of furniture products. Handcrafted in the mountains of Montana using solid, American grown wood, the artisans rough saw all the timbers and accessory trim pieces for a look uniquely reminiscent of the timber-framed homes once found on the American frontier. Grab a cold drink and seat yourself on this fine example of rustic style and charm. This barstool is the perfect finishing touch for your bar or bistro table. Seat height is 30", perfect for most bars and higher tables or just to sit at the breakfast bar.